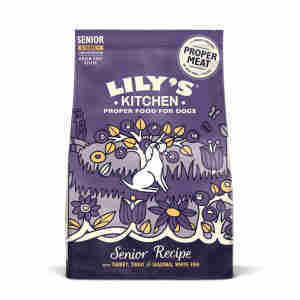 Created with older dogs in mind, the Lily's Kitchen adult 8+ senior recipe contains all the natural protein, fibre, vitamins and minerals your pet needs to stay active as he matures. Made in the UK from fresh ingredients, Lily’s Kitchen senior recipe is completely free from artificial flavours, colourings or additives. Instead, this wet food contains salmon, trout and turkey – all of which are full of healthy protein and Omega-3 and -6. These healthy fatty acids, along with the added seaweed and green-lipped mussels, help to keep your pet’s brain and joints in great shape as he grows older. This recipe is formulated especially for senior dogs aged seven years and over, so it contains all the supplements an older dog needs. Aniseed and added prebiotics soothe his stomach, while the organic fruit and vegetable fibres, such as potatoes, sugar snap peas, carrots, cranberries and parsnips help keep his digestive system working well. Older pets can sometimes experience pain in their joints, which may make your dog feel reluctant to exercise. This could lead to weight gain and the extra load could put further pressure on his joints. In order to keep your dog active, green-lipped mussel and salmon oil has been included in this natural recipe. This provides a great source of Omega-3 and -6 fatty acids which are essential for keeping joints supple, allowing him to enjoy ‘walkies’ again. Additionally, the fresh fish and natural meat proteins ensure he’ll feel satisfied without overeating and help him to maintain a healthy weight as he matures.